The Zell am See-Kaprun ski area is most famously known for the Schmittenhöhe mountain in Zell am See and the Kitzsteinhorn glacier at nearby Kaprun which are conveniently linked by a free ski bus. The new Glacier Jet 3 & 4 lifts open up new ski runs on the Glacier, ideal for intermediate to advanced skiers. Zell’s pedestrianised town centre is perched on the edge of Lake Zell and the atmosphere is boosted by regular music events, markets and festivals. Families are well catered for with a dedicated kid’s slope on the Schmittenhöhe in Zell featuring a combination of obstacles, tunnels and slalom course, and Kaprun’s Maiskogel mountain which is home to wide open, gentle slopes for learning and special kids’ meals at local restaurants. Beginners Learn at the top of the City Xpress, which allows access to the best snow conditions and wonderful views. Intermediates Will enjoy the wide open red runs on the Sonnenalm; alternatively take the Hirschkogel lift over to the Areit side and enjoy the long Schüttabfahrt down to Schüttdorf. Advanced Head over to the Sonnenalm for some off-piste and moguls or take one of the black runs back down to the village. Guests who purchase the Salzburg Super Ski pass can also ski in nearby Saalbach/Hinterglemm (approx. €12 return on the bus). Snowboarding Boarders will enjoy the new Fun Park on the Schmitten, as well as the blues and reds on the Sonnenalm. Rome Park fun park on the Schmitten, Glacier Park on the Kitzstienhorn. The family-run Hotel Berner in an elevated ski-in position just above the City Xpress gondola and Ebenberg chairlift. 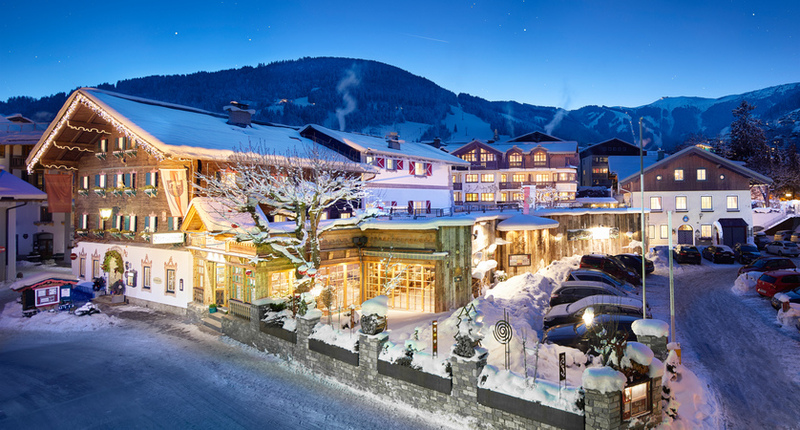 Conveniently located for both ski access and Zell am See's resort centre. Ideally located in the picturesque pedestrian area of Zell am See's medieval town and only a brief walk to the City Xpress gondola. The striking Austrian architecture stands out among other buildings. Expect a welcoming atmosphere and great personal service. The 15th century built charming Romantik Hotel is set in the ideal location on the edge of Zell am See's pedestrianized centre and adjacent to the lake. Occupying a superb, scenic position directly on the lake beside the pedestrian centre and railway, the Grand Hotel is a majestic hotel originally built in 1896. The four star Alpine Resort Zell am See is in a great location for skiers - the Schmittenhöhe and Sonnalm lifts are just a stone’s throw away and beginners’ slopes are situated directly outside the hotel. We are delighted to welcome the small and friendly Hotel Feinschmeck to our winter programme, where comfort and tradition is set in the heart of Zell am See’s town centre. Occupying a prime position just a stone’s throw from Lake Zell and a short walk to the City Xpress gondola, this little gem has an unbeatable reputation for service where nothing is too much trouble and guests are made to feel at home. The Salzburgerhof is a truly stunning hotel, it is officially rated as a 5 Star Superior making it one of the finest hotels in Austria. The Waldhof hotel is family-run and full of attractive traditional features combined with a modern influence. * Ski tuition 3 days 4 h per day. All Saver Packs must be pre-booked in the UK and are not bookable locally. Pass includes Zell Am See, Schüttdorf, Kaprun and Kitzsteinhorn Glacier. L (15-21 Dec 23 Mar -end of the season), H (All other dates). A child born from 2013 free only if adult pre-books the same. Beginners should book in resort for reduced prices. Adult Beginner Ski school lessons 4h per day and Intermediate 2 h per day. Child ski school lessons 4 hours per day. All snowboard lessons 2h per day. Private transfers and Self drive is available. Free with lift pass between Zell am See and Kaprun.